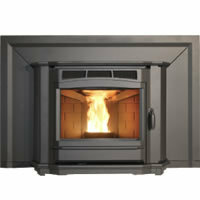 The Enviro Milan fireplace insert is a nicely styled unit with clean lines. The top, lower hearth front, optional skirt and the door handle are of cast iron. The viewing window is a large sixteen and a half inches by eleven and a half and shows off the cast iron brick effect firebox back. It has a cast iron heat exchanger and a quiet convection fan as well as an advanced glass air wash system to keep the glass cleaner. The surround skirt clips on and off to give easy access for maintenance. The Enviro Milan is thermostat ready and compatible with remote control. Depth into fireplace 15.2 in. Width: front 28 in., back 20 in. 44 in. by 30 in. Window Size 16.5 in. by 11.5 in. Construction Type Fabricated steel. Hopper lid and hearth front are cast iron. Two or four inch riser skirt to raise the front of the stove to hearth level. Check the ash pan and door gaskets, re-glue if necessary. If you would like to leave a review of the Enviro Milan fireplace insert, please use the form on the contact page.